The Fort Worth and Denver Railway (reporting mark FWD), nicknamed "the Denver Road," was an American railroad company that operated in the northern part of Texas from 1881 to 1982, and had a profound influence on the early settlement and economic development of the region. Company (FW&DC) was chartered by the Texas legislature on May 26, 1873. The company would later change its name to the Fort Worth and Denver Railway Company (FW&D) on August 7, 1951. 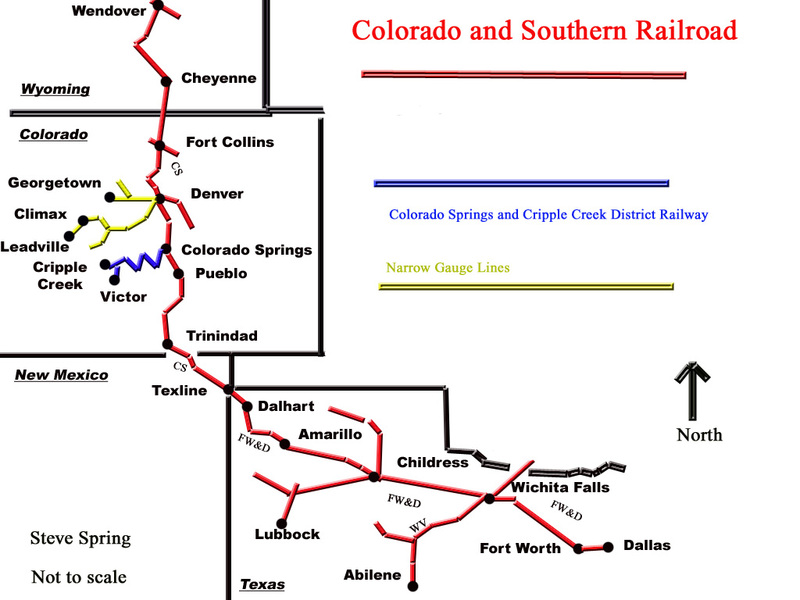 The main line of the railroad ran from Fort Worth through Wichita Falls, Childress, Amarillo, and Dalhart, to Texline, where it connected with the rails of parent company Colorado and Southern Railway, which became a subsidiary of the Burlington Route. met at Union Park, near present-day Folsom, New Mexico, 528 miles (850 km) from Fort Worth, on March 14, 1888. Railroad service between Fort Worth and Denver began on April 1, 1888. In 1895, Dodge became president of the company, one of several railroads he held a financial interest in. regional or national roads. The FW&DC was the first rail line to penetrate the northwest part of Texas, which contributed greatly to the growth of Texas cities such as Wichita Falls, Childress, and Amarillo. In addition, the railroad actively promoted settlement of the rural areas it served, providing free seeds, trees, and tree seedlings to farmers and ranchers to promote cotton and wheat growing as well as erosion prevention. In the first four decades of the twentieth century, the FW&DC built or acquired a number of feeder lines in its territory, so that by 1940, the Burlington-owned system operated 1,031 miles (1,659 km) of main track in Texas in addition to the Burlington-Rock Island Railroad. The Fort Worth and Denver City leased the Fort Worth and Denver South Plains (completed in 1928, 206 miles (332 km) from Estelline to Plainview and Lubbock; the Fort Worth and Denver Northern (completed in 1932, 110 miles (180 km) from Childress to Pampa); and the Fort Worth and Denver Terminal (providing access to railyards and terminals in Fort Worth). Several feeder lines operated by the Wichita Valley Railway Company (another subsidiary of the Colorado and Southern) connected with the FW&DC at Wichita Falls, including lines to Abilene, Texas and Waurika, Oklahoma. In 1952, the Wichita Valley and its subsidiaries were merged into the Fort Worth and Denver Railway. In 1925, the FW&DC had extended service from Fort Worth to Dallas by acquiring trackage rights over the Rock Island Railroad between those cities. At Dallas, FW&DC trains connected with the Burlington-Rock Island Railroad for through service to Houston. The premier passenger train of the FW&DC was the streamlined Texas Zephyr, which operated between Dallas and Denver from 1940 to 1967. 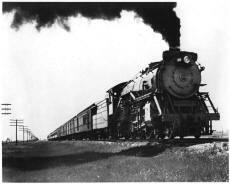 At the railroad's peak in 1944, during the World War II economic boom, the Texas Railroad Commission reported that the FW&DC earned $12,132,515 in freight revenue, $5,839,399 in passenger revenue, and $1,488,095 in other revenue. However, by 1972, in the face of competition from interstate highway traffic and airlines, the Fort Worth and Denver owned twenty locomotives and 1,520 freight cars, but operated at a loss of $1,743,551. 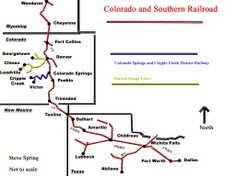 In 1970, the Chicago, Burlington and Quincy Railroad, the Great Northern Railway, and the Northern Pacific Railway merged themselves into a single railroad, the Burlington Northern Railroad; however, their subsidiaries in Colorado and Texas continued to have a separate legal existence until the Burlington Northern acquired the Fort Worth and Denver Railway by virtue of the merger between BN and the Colorado and Southern Railroad on December 31, 1981. The Fort Worth and Denver Railway's corporate existence came to an end when it was formally merged into Burlington Northern Railroad on December 31, 1982. The FW&D's former main line through the Texas Panhandle and North Texas is now a heavily used route of BN's successor, the BNSF Railway, primarily for coal and intermodal trains between Fort Worth and the western United States. Additionally, the Union Pacific Railroad has trackage rights on this line from Fort Worth to Dalhart. However, no passenger trains have operated in scheduled revenue service on this route since the FW&D ended all passenger service in 1967, before the creation of Amtrak in 1971. In 1989, BN abandoned the former Fort Worth and Denver South Plains trackage between Estelline and Lubbock. In 1993, the Texas Parks and Wildlife Department acquired 64 miles (103 km) of the abandoned right-of-way between Estelline and the town of South Plains to create the Caprock Canyons State Park and Trailway's hike and bike trail. The Saints' Roost Museum in Clarendon houses a restored Fort Worth and Denver Railway depot.